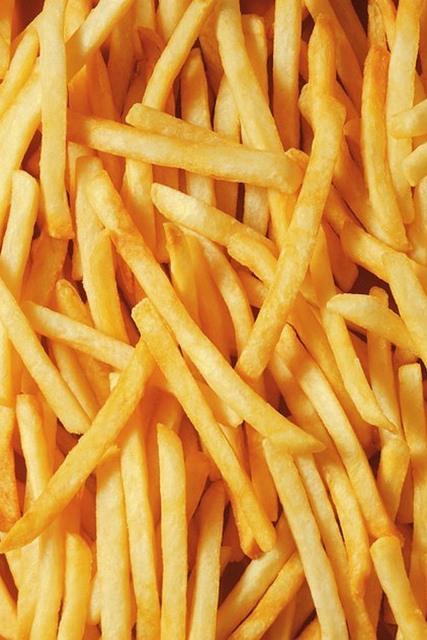 This article is an interesting insight into how McDonald’s makes its french fries. And yes, they really are made from potatoes! Take one Maris Piper variety potato, the best variety for fries – or chips as we call them in the UK, and peel it. Now I like chunky fries, so cut the peeled potato into chunky size portions. Give them a good wash in clean water then pop your raw fries into a pan of water. Bring to the boil and parboil for about 3 minutes only. In other words simmer vigorously for that time. No longer as you don’t want the fries to soften too much at this stage. After the par boil you can test them by using a fork. The potato should yield but not be too tough. The fries can now be finished off in one of two ways. Spray the fries with a Fry Lite (no calories) and put them on a tray in the oven set at 170C. I forgot to mention to preheat the oven. After 10 minutes or so in the oven turn them over to brown on both sides. At the end of 20 minutes check to see if your fries are golden brown in colour. Sprinkle paprika if you like spicy, or just some salt and vinegar if you want to taste fries ‘English style’. Deep fry them preferably using a strainer and purpose built deep fat fryer. It’s safer than using a pan on top of the stove.They are ready when they take on that golden brown appearance. Remember to shake the strainer over the fryer to shed excess oil and let the fries rest in the strainer basket for a few minutes before plating up. Again add your flavouring, spices or condiments of choice. Sides of mayo or tomato ketchup area good idea too!